Did you know 94% of recruiters believe LinkedIn is the top choice for finding candidates? According to a recent study, 55% of recruiters changed their minds about a candidate based on something they saw on their social media profile. If you’re not on LinkedIn, then you are missing out on major job opportunities. Develop a great Headline – Your LinkedIn headline shows up just below your name on your profile and represents your online brand. Since your name and headline are all a user will see when conducting a search on LinkedIn, make your headline count so the user will want to click on your full profile. “Marketer seeking opportunity” is weak, but “Consumer Products Marketer Seeking a Small Brand to Help Make it Big” tells your next boss that you plan to deliver. 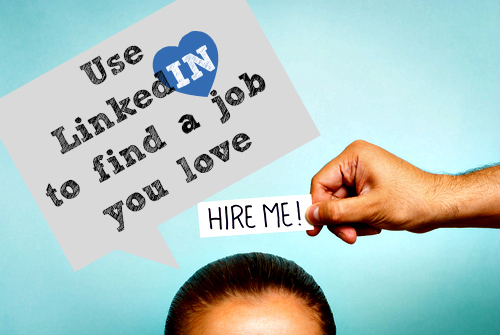 Job Hunting – If you’re job search is not a secret, then say so in your LinkedIn headline. Make it a winning headline like “Office Manager Seeking to Rescue Overstressed CEO”. If you are keeping your job search under the radar, then don’t use your headline to signal recruiters to call you, but you should make sure your headline is as human as you are in real life. Follow your target companies – Create a list of target companies you are interested in working for and follow them via their company page on LinkedIn. This is a great way to learn about the latest happenings, from new branch offices opening to new products being launched. Expand your Network – Since you are looking for as much visibility in your professional network as possible, invite new networking contacts and old colleagues to join your LinkedIn network. Download your online address books and invite people to connect. You can also use the “colleagues” feature to reconnect with people you used to work with. How to find Hiring Managers – To find a hiring manager on LinkedIn, use the Advanced People Search feature by clicking on the word “Advanced” next to the search bar at the top of the page. Fill in the most likely title for your hiring manager and the target company name. You can use this name on your cover letter to avoid the “resume black hole of death”. Once you find the hiring manager’s name, learn as much as you can about them. The more you know, the better your pitch! Read their profile, check out the Groups they belong to, and see which Influencers they follow. They will appreciate that you’ve done your homework. If you don’t have a LinkedIn profile, set one up today and start networking. You have nothing to lose and much to gain. If you need assistance setting up a LinkedIn profile, I would be happy to help. You can call me at (727) 278-4367 or email: MCKResumeService@gmail.com and be sure to connect with my on LinkedIn and let’s network!